North Korea’s state news agency, Korean Central News Agency (KCNA), reported that North Korea tested a new tactical weapon on November 15 under Chairman Kim Jong-un’s personal supervision. Testing of an unidentified tactical weapon does not violate the “voluntary moratorium” of nuclear testings, but Kim’s presence at the testing site implies a deteriorating relationship between the United States and North Korea. KCNA released a photo of Kim overseeing the testing of what the South Korean government assumes to be a multiple long-range rocket launcher. The exact type of artillery remains undisclosed, yet the South Korean government does not view this testing as a military provocation by North Korea. Still, it was Kim’s first public appearance at a weapons test site since the test launch of the first intercontinental ballistic missile in November 2017, which allegedly demonstrated the ability to reach U.S. territory. The New York Times cited a KCNA report that Kim was very pleased by the successful “ultramodern tactical weapon test” during his visit to the testing ground at the Academy of Defense Science, the core development research site of North Korea’s nuclear weapons. Despite the impression of successful negotiations between Kim and President Donald Trump at their summit in Singapore earlier this year, North Korea’s renewed activities at testing sites indicate denuclearization talks are stumbling. Voice of America reports that Vice President Mike Pence proposed a second Trump-Kim summit sometime early next year, expecting a full disclosure of the nuclear sites in North Korea; thus, the weapon testing is not a positive response from Kim. Though the U.S. is not mandating such disclosure before the summit, Pence has announced the need for tangible progress on denuclearization. Disclosure of nuclear testing sites is the first specific public request the U.S. has made of North Korea since the Singapore summit in June. Peace on the Korean Peninsula continues to be at risk. Amid cancellation of Secretary of State Mike Pompeo’s visit to North Korea for unspecified reasons in August, Chosun Ilbo, a South Korean news outlet, reported of multiple rocket launches in North Korea earlier this month, which was affirmed by an anonymous South Korean official. 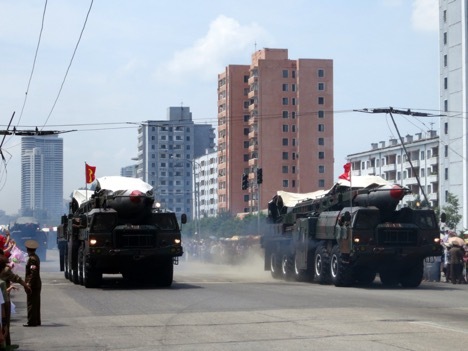 Similar rockets deployed near the 38th parallel threaten the lives of ten million South Koreans living in Seoul. VOA News also reported that satellite images of a structure in one of North Korea’s training grounds resembles the South Korean military headquarters, implying that it could have been built for target practice purposes. Earlier this month, the North Korean Foreign Ministry demanded sanctions be removed, suggesting a possible resurgence of nuclear development and testing if these demands are not met. Though North Korea did not release much information on the weapon it tested in order to avoid the situation from getting out of hands, it is perceived to be a “veiled threat” that is greatly aggravating the United States, reports CNN.